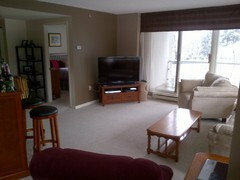 I'm trying to make a few simple changes to make my living/dining room area stand out a bit more. I had a love affair with brown when I moved in, and while I still like it, the room just needs a few accent colours in it. I really want to use the blue in the bench picture I've attached, even if I don't necessarily go with the bench. 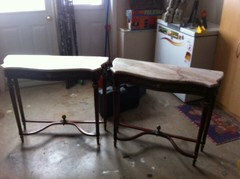 My question is whether it would work as a coffee table; I'm unsure given that it has arms on it. 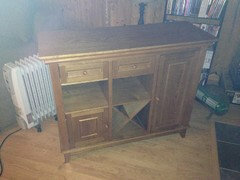 Then all I'd do is get some dark wood end tables (or stain my current ones) and then some new pillows and other things. I'd also like to use a darkish green as well, because a) there is a lot of blue/green stuff in the stores around here, and b) I have a green and brown painting on the back wall (not shown, I'll get a picture if I can shortly). Edit: I'll add better quality pictures when it's bright out tomorrow, and the lazyboy will eventually go. My cat uses it as a secondary scratching post, so the comfort of it is the only reason it's still around. Sigh, so so comfortable. 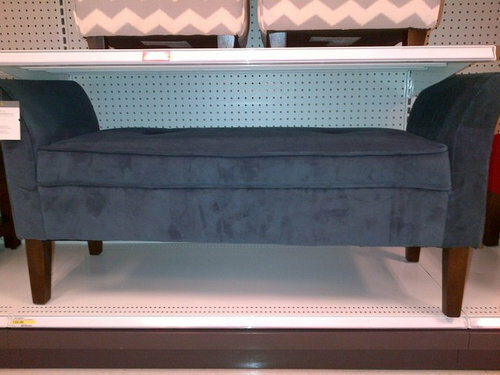 If you want a bench/ottoman I wouldn't get one with arms. 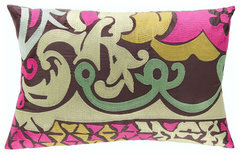 How about a stylish leather tufted one like this? It's reasonably priced. 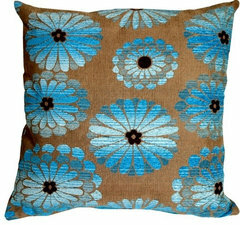 Then, do the blue colors you love in accessories and lamp base color. I figured I'd get comments about going with a leather bench because I agree it's probably the best way to go. 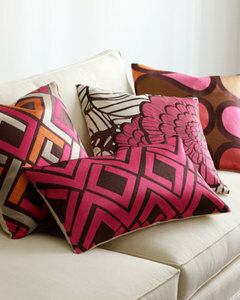 For the pillows I agree with the patterns; I need throw pillows for my other bedroom, so I may as well go to fabric store and get some custom ones made based on what I find. I have a bowl that is green, blue, and gold- would that colour scheme work? The chairs of my dining room table (which is connected as this is a condo) are that colour. That said, I'm willing to be very flexible here if you have some good suggestions. 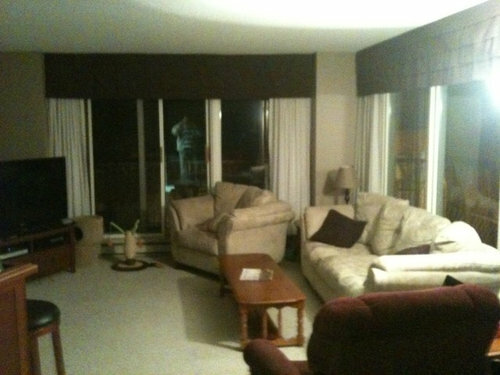 The window coverings, the matching couch and chair, and the TV will remain, otherwise I am willing to change anything. Just to give some background; I'm a 28 year old male bachelor. I'm definitely willing to go with bold choices (possibly including pink and purple) as long as the overall result is somewhat classy. Home Goods has wonderful accent pillows as well as bench/ottomans - Over the years I picked up a old steamer trunk I use for a coffee table in my TV room goes great with a brown leather sofa. OK, I finally was able to take some better pictures of the space. -All the stuff near the door (the desks, etc.) is just waiting to be removed. I'll keep that space bare, or maybe a small bench by the door. 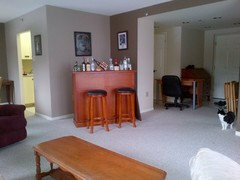 -The bar will be relegated to to the storage locker. I'll keep it for when I have a proper bar space, rather than just a living room. I think it's a good space and I like it, but it just needs some oomph. I need something to go where the bar is now, and I need some kind of a focal piece. How about turning your current coffee table into a bench? Silver leaf or spray paint the legs silver...cushion the top in fabulous blue fabric and add some blue silk ikat pillows to the couch (search on etsy for cost effective option). That is an interesting idea actually. Is the basic idea to put a piece of foam on the top and then just staple the fabric on the underside of the table? As an alternative to the bar, would the below liquor cabinet be a good fit? 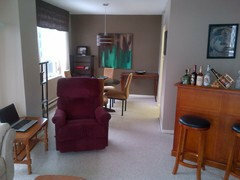 Alternatively putting the sofa table where the bar is and the liquor cabinet in the dining room. I also plan on moving the two bookcases into the bedroom to minimize the clutter. I guess you have got few very good pieces. 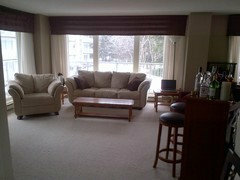 I would keep your Couch and bar area as they area same. 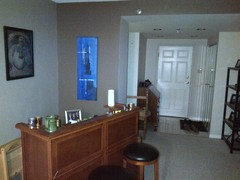 My suggestion for you would be to get the colors from the Art piece in Dining area and pull the room together. Try finding a rug that is Bold and have the color mix of Beige and Blue. Then get a Leather or Fabric ottoman. Find end tables with mirrored Or metallic finish. 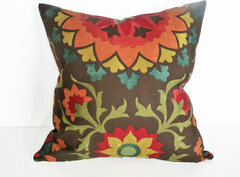 Get the throw and Pillows that can incorporate a mix of aqua blue, orange and dark brown. I will get back to you wit home pics. I like the rug idea. 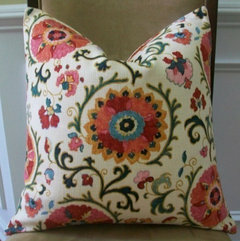 As I've said I just need a focal point; I was thinking a good table (maybe still am) but a rug would also do the trick. I'm going to go shopping a bit so I'll keep an eye out. Regarding the bar. If people like it I'll keep it as I do love it- I just feel it dominates the room. Maybe if I just made the liquor bottles less prominent, and put some blue and green knick knacks on it? I'm not trying to highlight my liquor collection, I just like being able to offer people a proper drink. I've also considered buying a nice electric fireplace insert and building a stacked stone mantle around it. 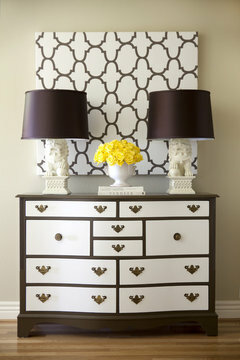 One thing I've been thinking about is painting some of the furniture I have. The bar and tv stand I'd like to do in an offwhite colour with brown trim, and the black and glass bookcase I've thought of doing in a bold blue colour. 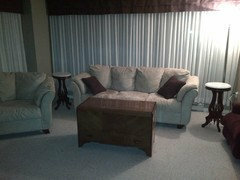 Then it's metallic end tables and a leather coffee table. I like the rug idea, but finding one around here that works is proving tricky. Updates! I've been busy on kijiji, so I've ended up with a few new things. I've also moved a painting from my bedroom into the living room, which is the colour I want to go for (alongside the green in the dining room painting). I think all I need to do at this point is refinish the chest as my living room table, and then add more of those colours with pillows and other items. The three pictures of my room are stuff that I've bought (obviously), and the marble sofa tables are for sale if I want them. They're a bit more than I want to pay to upgrade a table, but I'm willing to. 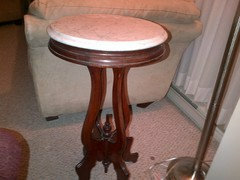 My end tables are marble topped, my window sills are all marble, and my countertops will have a marble look to them. Maybe replacing the current table with a marble topped one is a good fit. Is it possible to install 110V chandelier with concealed wiring?